The Belleville Valley is one of the Valleys in the Three-Valley. It is made up of three main areas, each with its own personality. With over 600km of pistes and a whole heap of backcountry & off-piste skiing available, the 3 Valleys offers some of the best skiing in the world with something to suit every taste from couloirs from the adventurous to lovely wide open groomed pistes for those who want to cruise. Due to its high altitude the season runs slightly longer in Val Thorens. You can enjoy the amazing slopes here from November to May. Val Thorens is the highest resort in the Three-Valleys, in fact it is the highest resort in Europe. At 2,300 metres above sea level, Val Thorens is one of the most snow sure resorts in the world. The resort makes up part of the larger, world famous, Three-Valleys ski area. With over 600KM of pistes and 180 lifts, there is not a larger resort in the world. The resort was purpose built in 1971, at the time only having three drag lifts. The resort has grown over the years, it has everything from nightclubs to Michelin Star restaurants. There are few catered chalets in Val Thorens. You will find more hotels and apartments. Many apartment buildings in the resort come with access to swimming pools or spa areas. Slightly lower down the valley is the resort of Les Menuires. This was the first ski resort to open in the Belleville valley in 1964. Like Val Thorens this resort is purpose built and great value. The west facing slopes soak up the sun all day. With a wide range of slopes available and most of the accommodation being directly on them. This resort is ideal for families that love to ski together. This resort has more Chalets than Val Thorens however you still find lots of apartments available for rent to holiday guests. 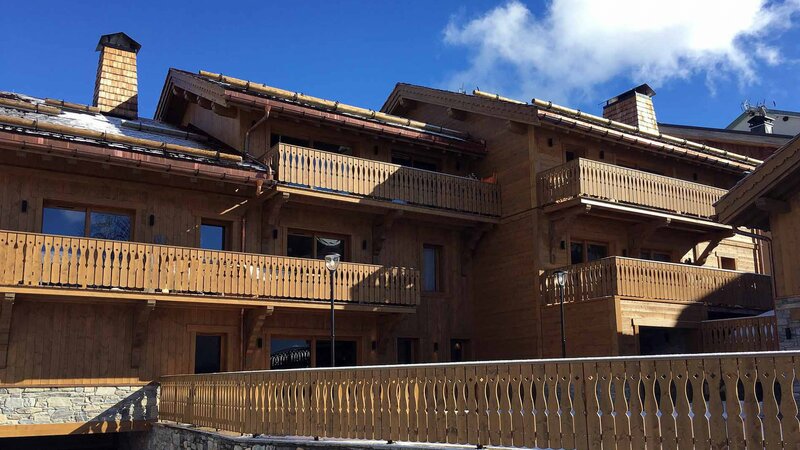 Due to the layout of the resort lots of this accommodation is directly on the piste. Saint Martin de Belleville is the lowest resort in the valley. Unlike Val Thorens and Les Menuires, this resort is not purpose built. It is a picturesque, traditional Savoyard Village. The resort is often described as a Village with a ski-lift. Though don’t be fooled by the description, the lift connects you to the world’s largest ski area. Therefore, visitors have the benefit of being in the world’s best ski area but also have stunning surroundings when they are not skiing. Keeping with the traditional village theme there are plenty of traditional chalet in Saint Martin. There are only three hotels in this resort which highlights how the Mairie wish for the village to remain a village. There is plenty of development in the resort however this is usually through renovations of existing buildings..